Auckland Museum is leading a Biodiscovery Expedition to the Kermadec Islands, with the Museum of New Zealand Te Papa Tongarewa, Australian Museum, and the Department of Conservation. We depart on the research vessel RV Braveheart on 9 May 2011 from Tauranga and return 21 days later. The 13 volcanic islands and islets of the Kermadec region are located between New Zealand’s North Island and Tonga. They are very remote – at least 1,000 km from their closest neighbour. The Kermadecs are part of New Zealand’s EEZ (Exclusive Economic Zone) meaning New Zealand has special rights over the exploration and use of their marine resources. The Kermadec Islands are the largest marine reserve in New Zealand at 7,450 square km. They are the last remaining unfished area in New Zealand, and one of the few marine areas in the world where large predatory fishes are in numbers and at sizes approaching that of natural, unfished populations. This ‘untouched’ environment is reflected across all marine animals and plants that live there. The islands extend the New Zealand EEZ into the warmer subtropics, resulting in an increase in marine species diversity. There are birds, whales, dolphins, fish, turtles and marine invertebrates (animals without backbones) that are rare or never found on mainland New Zealand. Some species occur nowhere else in the world. The Kermadecs link New Zealand’s marine environment of the northern North Island to the tropical South Pacific. In particular, the marine species composition appears similar to other remote islands to the west: Norfolk Island and Lord Howe Island. But links with populations among the islands of the Kermadecs, and between the Kermadecs and adjacent islands, are unknown. Despite the significance of the Kermadec Islands to the marine biodiversity of New Zealand, little is known of their marine flora and fauna. We are truly at the stage of discovery for this region. 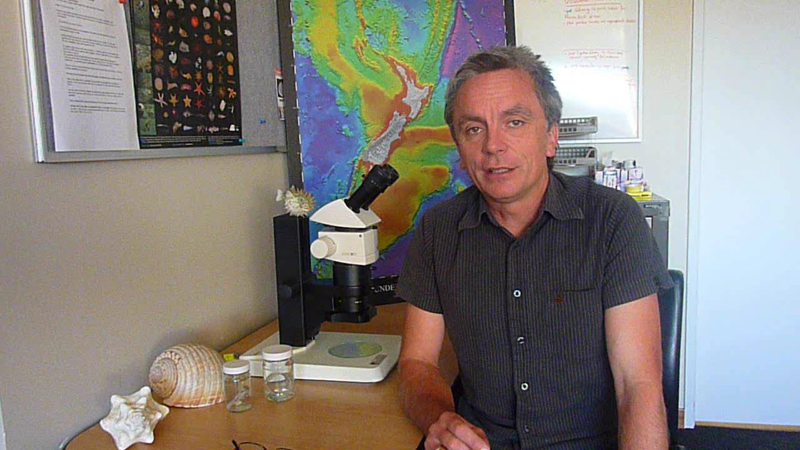 The limited amount of marine sampling that has been undertaken around the Kermadec Islands has made some remarkable discoveries: the only records of some species in the New Zealand EEZ, discovery of new species to science, and the surprising finding that some species of fish and invertebrates occur nowhere else in the world. The Kermadec Biodiscovery Expedition will fill the gap in our knowledge of the marine plants and animals that occur, and their connection to marine populations in the adjacent subtropical western Pacific Ocean. We will also discover species not recorded previously from New Zealand waters, and it is likely that new species will be discovered. Document the marine biodiversity of the Kermadec Islands. The focus is on marine plants and animals within 200m of the surface, and on species occuring to 1,000m. Discover and document new marine species and new records of marine species not recorded previously in New Zealand. Use molecular techniques to determine the connectivity of the marine fauna of the Kermadecs and adjacent South Pacific islands. That is, determine the source of the closest relatives of the Kermadec populations. Provide a baseline record of species diversity against which to monitor changes over time. This will be an important reference survey to track changes in species composition that may result from global warming effects on regional water temperatures and currents. The results will be published in peer-reviewed journals and popular articles. You can also follow the excitement of discovery during the expedition through this website. The experienced research team are scientists from five agencies and they have superior knowledge of marine species in the region, and the projects complement each other and previous surveys. To help keep you up to date with what the expedition team are up to, a science communicator and an underwater photographer are also on the RV Braveheart with the scientists. Videos and photos will be send back to the Museum using the Sailor 150 Fleetbroadband unit, a maritime broadband system. Staff in Auckland Museum will be co-ordinating with the ship to post blog entries, and respond to your comments. Bear with us – the team are a long way out to sea! Funding and support for the project has come from the three participating museums (Auckland Museum, Te Papa and the Australian Museum), the Department of Conservation, Richard Robinson - Depth, the Pew Environment Group, a generous charter subsidy by the owner of the RV Braveheart, and a fuel subsidy by Gull Oil.